As online slots fans we are happily accustomed to making the virtual journey to the mystical and mysterious east. There are so many with an oriental theme that we’ve even picked our top five which you can check out by clicking here. 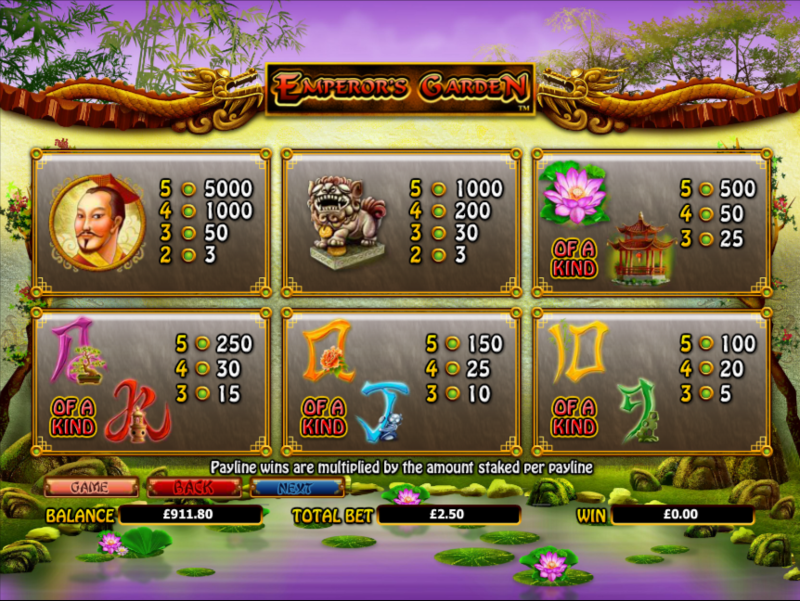 NextGen Gaming have now chosen to join the party with Emperor’s Garden which is an extremely pretty looking game. Emperor’s Garden is a five reel slot with up to twenty five paylines and unsurprisingly it’s the backdrop which creates the zen-like atmosphere. There’s a Koi pond below the reels which are themselves surrounded by oriental trees and drawings. The soundtrack is typically Japanese. The main symbols are a pagoda, a pink lily, a dragon statue and the Emperor himself. 9, 10, J, Q, K and A are the standard lower values. Special symbols include the garden wild and the Koi scatter. The wild symbol appears only on reels two, three and four but when it does it will stretch to fill up the entire reel, offering more winning opportunities. The Koi carp scatter symbol is what you need here and landing three or more anywhere in view will do the job. All wins during this feature will be subject to a 3x multiplier and the really good news is that the spins can be triggered again by landing more Koi symbols. There’s a ‘Gamble’ button below the reels and after any win it will light up and become clickable. You can now choose to wager that win by playing a card guessing game. Choose red/black to double your win or pick the correct suit to quadruple it – you can have up to five correct guesses but it’s unlikely you’ll make it that far. A wrong guess means it’s game over and the win is gone. Steer clear of the gamble feature, you’ll be unlikely to find yourself better off if you use it regularly. 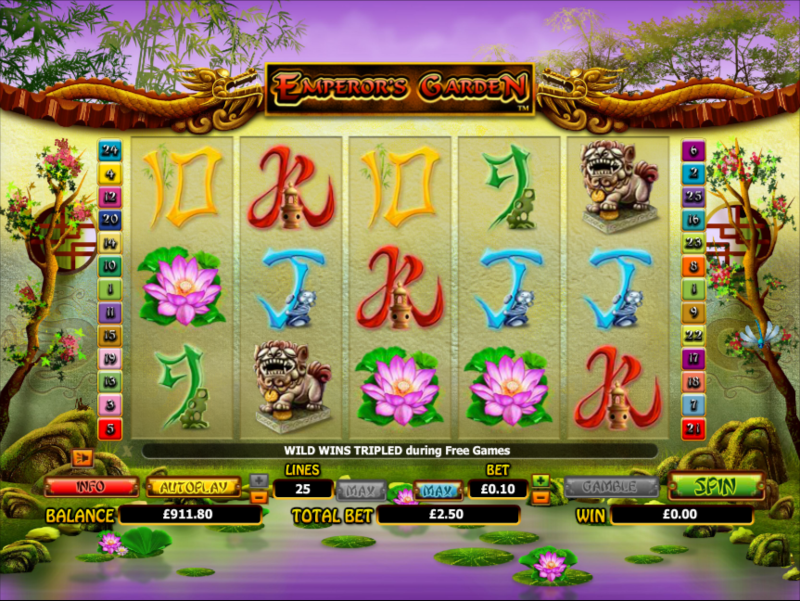 Emperor’s Garden certainly looks the part but it does lack a little in the creativity department compared to some other NextGen slots. The spins are also a little hard to trigger but it’s worth a go if just for the music and the graphics.